Are you a "kind" of mom? There are many kinds of moms: crunchy moms, nursing moms, helicopter moms, formula moms, full-time working moms (FTWM), part-time working moms (PTWM), stay-at-home mms (SAHM), work-at-home moms (WAHM), corporate moms, PTA moms, etc. We find ourselves attracted others that we deem as similar to ourselves within these groups we think we fall into. I belong to a few on-line mom groups where I often get advice and support for raising my children. I can bounce off my concerns, ideas, and worries about cooking meals, handling tantrums, juggling schedules and overall parenting woes. 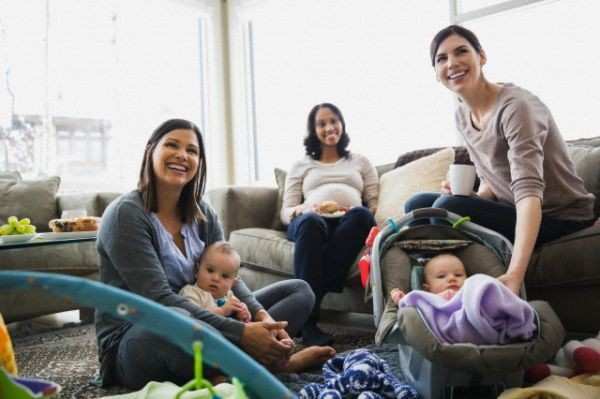 The groups have been very helpful to me as I transitioned from Expectant Mom to New Mom to Worried Mom to Mom of 2 under 2 and then on to Moms of School-Aged Kids. One of my groups recently created a spin-off, sparked by a stay-at-home mom asking for additional support from other stay-at-home moms. She didn't feel comfortable asking for advice from the "regular" moms because she felt they may accuse her of complaining about her situation. She knows she's lucky to stay home with her children, but she worried other moms (specifically those who work) may not be as supportive of her concerns or consider her to be whining about her situation. What is a "regular" mom? Does she stay home? Does she work? Does she work part-time? Does she work nights so she can have days home with her children? When we see other moms at the park or swim class, do we assume we know the kind of moms they are? I've been a FTWM, and I was terrible at it. I would drop off my baby boys at daycare and cry as I walked out the door. I struggled through meetings I thought were pointless because I wondered what my children were doing and I resented being there when I felt I should be with my kids instead. I would do grocery shopping on my lunch hour and see other moms pushing their babies in their shopping carts and feel a twinge of jealousy that they were spending fun, simple times together with their children. Then I became a SAHM, and again felt I was terrible at it. The house was never as clean as it was when I worked FT, I pressured myself to fill their days with fun playdates and activities, and I challenged myself to create fun-to-eat toddler meals for the boys. I would be at the grocery store at lunchtime with the "both need a nap ASAP" boys and see a mom dressed for a day at work - getting her groceries on her lunch hour - and picture her getting a coffee at Starbucks on her way back to the office and she could possibly close her office door and shut everything out for the last five minutes of her lunch break, like I used to do when I was her. I felt a pang of jealousy for those five minutes of quiet, calm, alone-time that a SAHM doesn't really have. Recently, the CEO of Pepsi-Co Indira Nooyi gave an interview where she spoke about her feelings of women not being able to have it all. This stirred controversy because many women (not just moms, but women in general) feel we can have it all while others feel that we must compromise on some aspect of our lives whether it be marriage, career, family, or even health. She revealed a comment she received from her own mother, after she had been named to the corporate Board of Directors: "You might be president of PepsiCo. You might be on the board of directors. But when you enter this house, you're the wife, you're the daughter, you're the daughter-in-law, you're the mother. You're all of that. Nobody else can take that place." Critics pounced on Nooyi because she shared the sentiments of so many women and mothers. I saw it even in some of the mom groups I belong to. Some of the FTWM felt they do have it all and find it hard to believe Nooyi would say the contrary. Some SAHMs agreed with Nooyi but still criticized her choices, implying that Nooyi was putting herself before her family. One can see both sides of the issue that Nooyi addressed but ultimately women could stick together and support each other even if our choices are different. Do you remember our Facebook post from yesterday about Olivia Wilde's photo in Glamour magazine ? It's a beautiful photo of a beautiful breastfeeding moment between a confident mother and her child. The FB threads about the topic were polarized even within similar "kinds" of moms. Breastfeeding advocates applaud Wilde for raising awareness for nursing and demonstrating the wonderful bonds created between a new mother and her baby. However, even within that group, some breastfeeding supporters feel a woman should cover up when nursing - and the cover of a magazine is no place for this type of intimacy. Whether you are a FTWM, helicopter mom, corporate mom, tribal mom -- we are all moms with similar struggles and stories. We have information and guidance we can share and gain from each other. I've settled into being a PTWAHM, which allows me to spend time away from my family but I can still be here for their big (and small) moments. It's really up to me, my family and my children to decide what kind of mom I am (and will be). I'll try to push away any criticisms and pull in the positive sides of each kind. Today, I am happy being the Hands-On mom. I may have deadlines to meet and customers to call - but I prefer to set those tasks aside and answer the most recent request: a two-year-old who just wants to snuggle up and "ead a tory wiff oooooh". I think all kinds of moms would agree with that decision. Do you pamper yourself anymore?